From the Fire, the spring theater production of Eugene Lang College The New School for Liberal Arts, was both a both box office and critical success, selling out its run and receiving glowing coverage in The New York Times and WNYC. 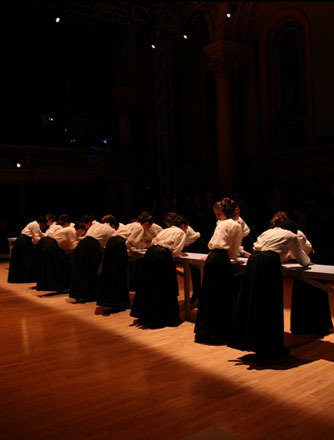 An original oratorio based on the Triangle Shirtwaist Factory Fire, From the Fire debuted with a five-night run in March at the Judson Memorial Church, mere steps from the site of the blaze that changed the course of American labor law. The production was developed through a collaboration among composer Elizabeth Swados, Lang’s visiting artist for 2009-2010; librettist/director Cecilia Rubino, assistant professor of Theater at Lang; and poet Paula Finn. Lang students made up the majority of the cast crew. The From the Fire creative team is currently raising money to mount additional productions of the show. To follow its progress, visit www.trianglefromthefire.com.